Travel writer Rachel Hunt concludes her Italian adventures, which have taken her to Lake Garda, Tuscany and Rome, with a stay on the stunning Amalfi coast. After a 90-minute drive from Naples station along the breath-taking coastal roads, we weave our way through the mountains, battling rainstorms and reaching points almost as high as the clouds. Afraid of heights, then don’t look down! It’s not one of the easiest destinations to reach but like a pot of gold at the end of a rainbow the elegant, cliffside Hotel Santa Caterina is well worth the journey. The family-run hotel opened in 1904 and is now in its fourth generation. Set in an art deco villa on Amalfi drive, it offers a courteous and old-fashioned charm. 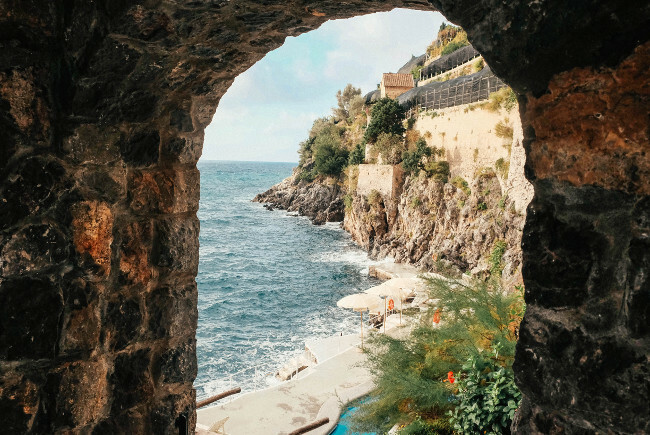 With the likes of Brad Pitt, Angelina Jolie, Kim Kardashian and Hillary Clinton staying as guests, Hotel Santa Caterina offers the perfect hideaway. Amalfi is famous for its lemons so naturally Hotel Santa Caterina has its very own lemon grove. The hotel uses this produce as a key ingredient in some of the mouth-watering dishes on the menu at the hotel’s restaurants. It makes the most of its desirable south-facing waterside location. There are two ways down to the beach club, you can either take a gentle stroll down through the gorgeous gardens or you can call for the panoramic glass lift, (again not advisable if you aren’t so keen on heights)! The beach club features a sundeck with loungers, a seawater pool, bar and ladders into the sea when the sea is calm enough to swim in. We arrived during the start of a storm, so on this occasion we enjoyed watching the waves from afar, but it was nice to see the slightly moodier side of Amalfi. If like me you are a lover of fitness (and want to balance out the carb ratio), you can also join the hotels resident fitness instructor for a spot of Yoga by the seafront. I really enjoyed this activity – practicing next to the sea definitely beat my usual studio practice at home. Though its cliffside perch offers spectacular views of the shoreline, the property itself should not be overlooked. 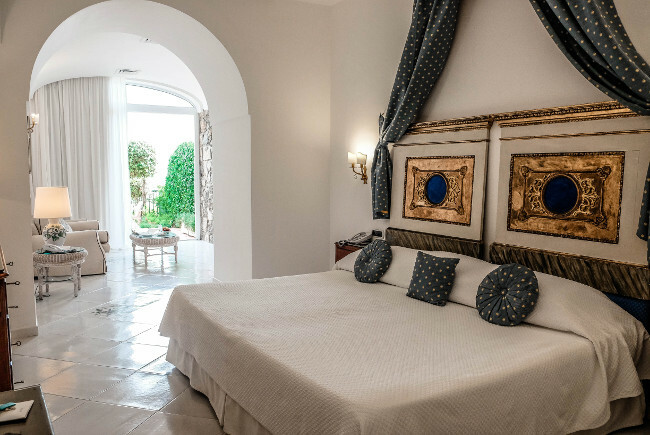 The beautiful main building is a converted villa with 55 rooms, but there are romantic standalone folly-suites embedded in the gardens for those who wish to have a little more privacy during their stay. An art deco theme runs throughout, a gentle nod to its original heritage, its minimal but classy. White-washed walls keep things bright and airy whilst colourful ceramic tiles and furnished with family pieces, give character and warmth. All rooms have terraces and balconies overlooking the coastal views, but no two rooms are the same. Our room was a suite and had its very own living room and garden area. The bathroom tiles, which were bright and vibrant surrounding a big whirlpool bath captivated me, I spent quite a lot of time in there! 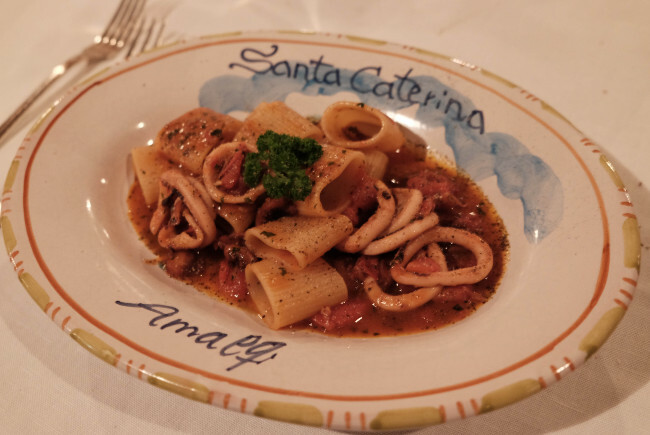 The Italian food has been a highlight of the trip, the menu at Hotel Santa Caterina is no exception and hits the spot. There are two on-site restaurants serving fresh, local produce which tastes all the better when enjoyed with ocean views. During our stay we dined at Al Mare, and enjoyed fresh handmade pasta dishes and fine wine as we listened to the live acoustic music from the restaurant. Dinners at the al la carte Santa Caterina restaurant will find slightly more formal and refined dishes on the menu. Breakfast is also served in this restaurant. 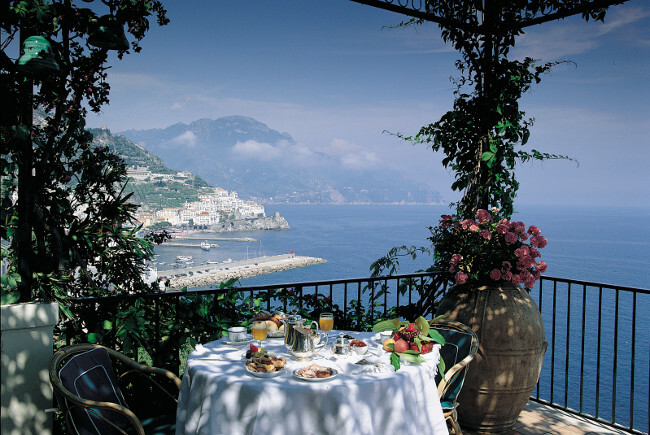 I really enjoyed breakfast here, you can sip from Hotel Santa Caterinas very own branded coffee cups, enjoying views of the Tyrrhenian sea whilst planning your day ahead. The friendly staff were very helpful our waiter explained he felt like part of a family at the hotel, many staff have worked at Hotel Santa Caterina for many years, it was lovely to hear how much he loved his job. The hotel has a prime spot close to Amalfi centre. We took advantage of the hotels free daily shuttle into town which leaves and returns every half an hour until midnight. Amalfi is one of the most historic towns along the Amalfi Coast. The focal point of the historic centre is the Piazza del Duomo, in front of the striking cathedral. The piazza is clustered with sidewalk cafes and elegant shops, lots of gelato stops and great restaurants. On our last evening we decided to enjoy one last authentic Italian pizza at a restaurant that overlooked the 9th century cathedral. It was lovely to sit one final time to reminisce about our incredible 7-day Italian adventure. We have certainly put in some miles! 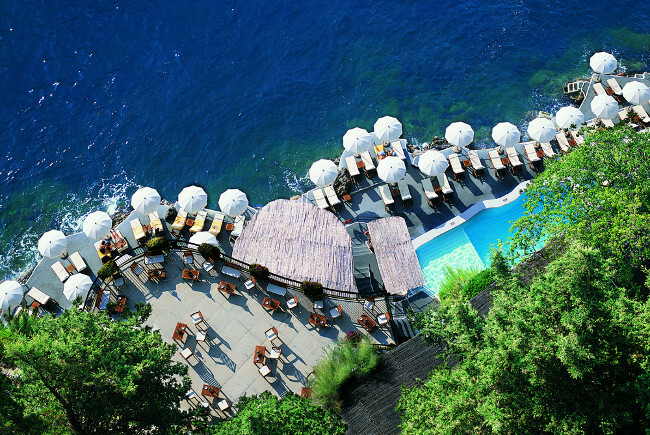 The Hotel Santa Caterina is timeless. It’s been cherished by the Gambardella family for many years and is definitely one of the treasures of the coast. Our stay in Amalfi was the perfect way to round off our trip. As in so many family-run Italian hotels, the service is special, and upon our departure we were wished the warmest of farewells. We loved our time here, I can see why it draws people back time and time again, and I think I may just be one of them.